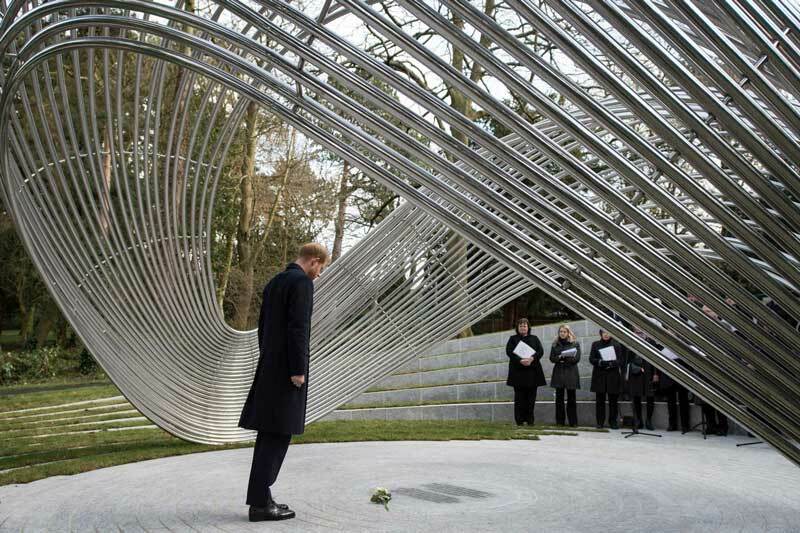 Erected in the memory of the 31 British nationals who died as a result of the terrorist attacks in Sousse in June 2015 and the Bardo Museum attack in March 2015, the ‘Infinite Wave’ sculpture was unveiled by the Duke of Sussex in a ceremony at the sculpture’s location in Birmingham’s Cannon Park on Monday 4th March. The Duke of Sussex was joined by 300 guests, which included families of the victims and those caught up in both attacks. The ceremony, led by BBC newsreader Ben Brown, who reported from Sousse soon after the terrorist attacks in June 2015, included readings from families of the victims and music from a the Birmingham Bach Choir. M-tec were approached to fabricate the complex sculpture which was designed by George King Architects. 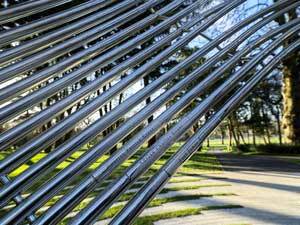 Taking approximately 4 months to fabricate, the design of the sculpture is a tubular design made from 316 stainless steel schedule tubes. It was fabricated in three sections using specially designed jigs– two end sections that were welded and polished as a complete assembly and a middle section that was a series of individual polished tubes that connected the two ends. The sculpture was a particularly complex design due to the fact that no two tubes were identical to each other. Other challenges included maintaining the structural integrity of the fabrication, the need to transport and install the sections without causing any damage to the sculpture because of the irregular shape of each section, the positioning on site so that the middle sections fitted correctly and also the polishing of the sculpture both in the workshop and on site to achieve a mirror finish. This marks the second of our sculptures to be unveiled by HRH Prince Harry, the first of which being the Folkestone WW1 Memorial Arch which was unveiled in 2014. We would like to take this opportunity to thank everyone involved in the fabrication and installation of yet another stunning stainless steel memorial. This is a perfect example of what can be achieved when engineers and architects work together to create something truly unique.